Helps administer, monitor, manage and optimize the performance of IBM data management platforms across the hybrid data enterprise. What platforms does IBM Data Server Manager support? Data Server Manager supports Db2 for Linux, UNIX and Windows; Db2 for z/OS; BigInsights; Big SQL; Db2 on Cloud; Warehouse on Cloud and Db2 Warehouse Private. It offers unique features for each of these products. The link below provides additional information. Is there a quick start guide? Yes. The link below provides information on how to get started with basic installation. How do I install and upgrade Data Server Manager? 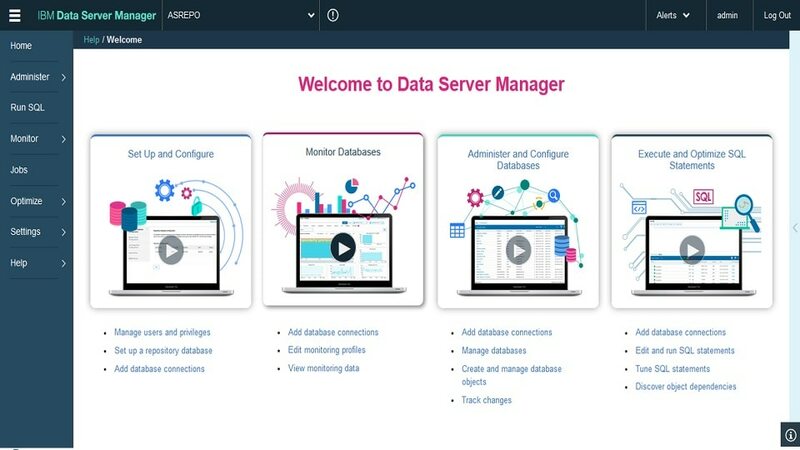 The link below provides information on how to install Data Server Manager, upgrade an existing installation and extend functions by applying a license activation kit. Are there any capacity recommendations for setting up Data Server Manager? Yes. The link below provides capacity recommendations for setting up Data Server Manager in your environment. The link below provides system requirements for the supported release of Data Server Manager.